On Saturday March 25, 2017, the Elton John AIDS Foundation (EJAF) and the Hammer Museum at UCLA presented a special celebration honoring Elton John's 70th birthday and his unprecedented 50-year songwriting collaboration with Bernie Taupin. Hosted by actor Rob Lowe, the event was held at Red Studios and sponsored by AEG Presents, Neuro Drinks and Diana Jenkins, and Survival Pictures. The celebration was chaired by David Bohnett, Richard Buckley and Tom Ford, Sir Lucian and Lady Caroline Grainge, Diana Jenkins, Marilyn and Jeffrey Katzenberg, and Jay Marciano. The gala dinner was designed by Craig’s Los Angeles. Perrier-Jouët provided champagne, Domaine Bertaud Belieu wines, Chopin Vodka and Clase Azul Tequila spirits, and La Tavola table linens. Host Rob Lowe noted in his opening remarks, “[Elton and Bernie] are two incredibly talented people, whose impressive body of work and long creative partnership have a great deal to teach us about love and loyalty and to inspire us to reach out to others in need. In fact, Elton specifically wanted us to use his birthday and this special occasion to support two causes he cares about a great deal – the visual arts and ending AIDS.” To that end, the event raised nearly $2.8 million to help fund the grant-making initiatives of the Elton John AIDS Foundation and exhibitions and programs at the Hammer Museum. Actor James Corden introduced a video paying tribute to Elton’s songwriting collaboration with Bernie Taupin. 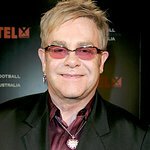 But first, he read a special tribute to Elton and Bernie penned by renowned pop music critic Robert Hilburn, former music editor of the Los Angeles Times from 1970 to 2005, who covered many of Elton’s major U.S. performances, including his very first American performance at the Troubadour in West Hollywood. Throughout the evening, surprise musical guests presented special tribute performances. Singer-songwriter Ryan Adams performed “Rocket Man.” Grammy Award Winner Rosanne Cash sang “Border Song.” Grammy and Golden Globe Award winner Lady Gaga performed acoustic versions of her hits “Born This Way” and “Bad Romance.” And multi-Grammy Award winner Stevie Wonder rounded out the night with “Daniel,” “Sorry Seems to Be the Hardest Word” and along with Lady Gaga also sang “Happy Birthday” for Elton.